Limit Facebook Apps or Games Notifications to be shared only on your profile or two or multiple friend(s) as per your desire level is. Here is a comprehensive guide. This is one of the most important security point that must be properly configured, not only for the things you possible do not want to share publicly, it avoids various security issues. Most of the regular readers of this website, possibly can recall two important guides in this regard – one is How to Create a Custom Friend List in Facebook and another is the potential security risks Facebook never told you and some ways to fix them. Before we go through this guide on how to Limit Facebook Apps or Games Notifications, there are some important practical and theoretical points needed to be mentioned. Undoubtedly, Facebook is their own Infrastructure as a Service (IaaS) Provider. The way usually we create any Facebook App ; we use either Heroku Cloud like PaaS or our own IaaS with SSL. Whatever it is, to Facebook framework, it works like a PaaS and the API is the point of the security checking – that is what we discussed before in another article. As the end user is not a developer, for them a Graphical User Interface is provided to control the Security points, this is a level below the blocking or limiting level from Facebook’s all posts level. The first level is at PaaS level, second one is at higher level – from Facebook’s IaaS level. We do not know how is that API – that higher control is not open source, from practical point, we do not need to know that part. So, officially, Facebook API is the API for Facebook Apps. Apps and Games are same. Facebook API for Profile control is not available publicly, so we use the Graphical User Interface – there is no option for API based control. Open Graph is way to reveal some data only selectively as layer, which we basically shown in our guide – Find Your Facebook Fan Page ID and Facebook Profile ID. Why these points are coming when we are discussing a simple thing – How to Limit Facebook Apps or Games Notifications ? The image is getting blocked in the above case due to wrong and confusing logic due to manipulating Facebook’s security from one level up than the game. Facebook is understanding that “none” should see the SSL protected things, but that “none” includes all. So for that App by academia.edu I will unable to see Dr. Shang’s face as well as the whole profile webpage either. For this reason, Facebook gives that testing tool to preview what you can see as if you your Facebook Friend. But it can fail in complex cases. So how to set the things properly so that, Dr. Shang does not create this situation ? 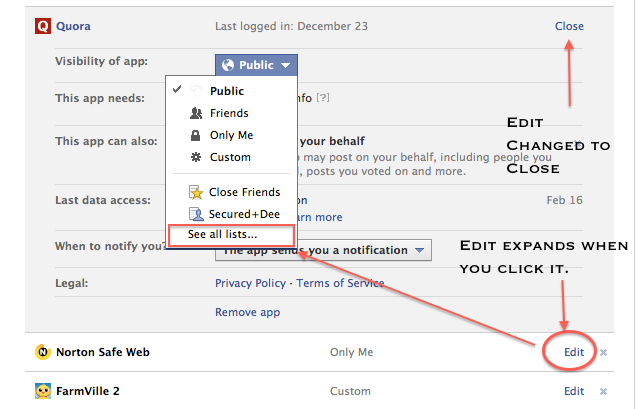 Or rather in easy words – How to Limit Facebook Apps or Games Notifications Within Only Two Persons ? Keep in mind, we can never override certain settings of Facebook, because frankly we do not own it. The video shows the part of the wrongly set issue plus how to limit the notifications not to be visible to all. First, create a Custom Friend List in the way we described before in the old article. Funnily, Facebook has a flaw by using a trick for creating Public named custom friend list. That is different topic. You can Add only one person in that group. Click the Edit link. It will expand. Under Visibility of app, click the dropdown and select your List created in step 1. You can create a test profile and also include it to check whether its working fine. The result is, in my case; for academia.edu App, the Notifications will be limited within me and Dr. Shang. It might appear to you that, everyone is viewing it, no; for your obsessive compulsive disorder, checking it from another profile, which is definitely not within that list created in step 1, will reveal the real fact – Facebook is blocking it to be visible. The question that is popping up in your mind – Why to create group, we could easily add one person in the App Security and Visibility Settings. In case of group, you are telling Facebook, not to show anywhere if that rule is applied. But in the second case, you are actually using the App specific API only. Plus, its easier to write academic things only intended for Dr. Shang in my case in Facebook Posts. Personally I do not think Facebook is very safe, so it is almost mandatory to use such settings if your number of Friends are in four digits and might have few fake profiles. This Article Has Been Shared 8077 Times! Git : What is this Git ? Git is a free software for distributed version control of files which originally developed for source code management of the Linux kernel and slowly extended. SaaS Checklist sound bizarre but it actually serves various useful purposes for the users, developers and those who want kind of monetization through SaaS. Hybrid Security for Hybrid Cloud – Securing a hybrid cloud, poses great challenges. Not only for the users but also for the providers, it is not enough simple. Cite this article as: Abhishek Ghosh, "Limit Facebook Apps or Games Notifications : Video Guide," in The Customize Windows, March 2, 2013, April 21, 2019, https://thecustomizewindows.com/2013/03/limit-facebook-apps-or-games-notifications-video-guide/.